Interrogation is an art. You are my canvas. 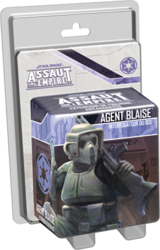 Bring a touch of subversion to your Empire Assault games with Agent Blaise, Interrogator of the BSI. The Imperial Intelligence Project Card Series provides the Imperial Player with unique options that will fit into any campaign. This expansion also contains new Command Cards and two unique Skirmish missions to play one on one.